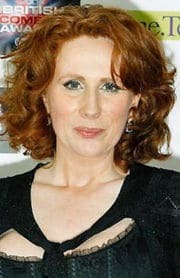 Catherine Tate (nee. Catherine Ford) was born in Bloomsbury, London on 12th May 1968. She was brought up in London, attending a Catholic primary and secondary school. During her years at secondary school, she became something of a rebel, developing a keen sense of humour, which made her a natural ringleader. In her most famous character, Lauren, there is an element of autobiography. Catherine Tate is in many ways a reluctant star. She doesn’t revel in the limelight like some stars and sometimes prefers to slip into events through the back door unnoticed. She also sometimes suffers from panic attacks and after the birth of her baby, Erin suffered from post-natal trauma. Catherine is a firm believer in astrology and frequently consults her star signs. After taking her A-levels in the sixth form of Salesian College, Battersea, she went to study art and drama at a local drama school, The Central School of Speech and Drama. Catherine began her acting career by appearing in a variety of tv dramas such as Casualty and the Bill. She also appeared in minor roles for comedy programmes such as The Harry Hill Show and the Wild West. It was during her acting in “Wild West” that she was spotted by the casting director; this led to her own show the very popular “Catherine Tate” show. She had recently been developing stand-up comedy role. This series enabled her to develop a range of characters, some of which have passed into popular folklore for their comic repertoire. The first series of six episodes was shown in February 2004, they quickly attracted a dedicated following and has grown into one of BBC Two’s top shows for viewing figures. The second series did even better, although it was helped by being shown straight after the series Extras. Lauren. – Lauren is a disaffected teenager -a rebel without her cause. Frequently arguing with authority figures she tries to look as cool as she can to her friends. Much of her comic effect comes through the repetition of her stock phrases such as “Am I bovered” “Do I look bovered”, “Are you disrespecting me and my family?” Each phrase is repeated with a sarcastic glare. Whatever the situation, the dialogue usually ends up along these lines. One of Catherine’s greatest comic moments was at a Royal Variety Performance when she went to the Royal Box and said. “Is one bovered”. Allegedly one of the people in the box was asleep. Remarking to the Queen she said. Prince Phillips is supposed to have said at the interval he had been “disrespected” although whether he was joking or being serious it is not clear. Joanne “Nan” Taylor – the foul-mouthed grandmother. – Always embarrassing her grandson with an unexpected explosion of expletives and prejudices. Janice and Ray – A Northern couple who find great disgust in having to pay £2.50 for a sandwich from a petrol station. Catherine has one child Erin, through her partner, stage manager Twig Clark. The family have a home in Fulham, London. Citation: Pettinger, Tejvan. “Biography of Catherine Tate”, Oxford, www.biographyonline.net, 25/1/2009.